Conformational analysis and enzyme activity: models for amide hydrolysis. How do molecules interact with each other? Understanding how molecules interact (bind) with each other when in close proximity is essential in all areas of chemistry. 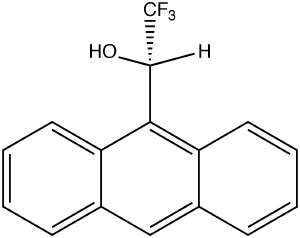 One specific example of this need is for the molecule shown below. This is the so-called Pirkle Reagent and is much used to help resolve the two enantiomers of a racemic mixture, particularly drug molecules. The reagent binds to each enantiomer of a racemic drug differently, and this difference can be exploited by using e.g. column chromatography to separate the two forms. The conventional wisdom is that such chiral recognition occurs via a three-point binding model. In other words, at least three different interactions must occur between the Pirkle reagent and the drug to allow such chiral recognition. A bond critical point, which is the key to understanding not only where actual bonds are in the molecule, but also a range of weaker interactions which are conventionally not graced with the term bond, but which nevertheless can be essential in understanding how to molecules interact weakly with each other. The remaining two types of critical point relate to rings and cages, and we will not be concerned further with them here. The electron density required for this analysis could in principle come from the X-ray measurements themselves, but it is not easy to acquire this to the required accuracy (although it can be done). In this case, it is easier (and probably no less accurate) to calculate the density from a DFT-based quantum mechanical calculation. The result of this is shown below. Pirkle dimer. Click for 3D. The light blue spheres show the position of selected bond critical points or BCPs in the AIM analysis. So what do they tell us about how two molecules of Pirkle molecule interact with each other? Three different points labelled 1-3 are highlighted for discussion. 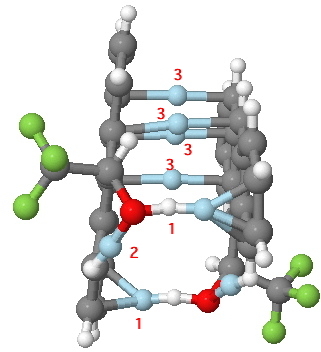 Points 1 connect the hydrogen of the OH group with the carbons of the π-face of the anthracene ring (the left ring of the molecule as shown above). This is an unusual type of interaction known as a π-facial hydrogen bond, and it has only been recognized as such in the last 30 years. Note that this interaction is not restricted to occur just between a pair of atoms, but can involve more (in this case almost a whole benzene ring). By finding the value of the electron density ρ(r) at this BCP, one can estimate the energy of interaction resulting from its formation. In this case, ρ(r) ~ 0.014 au, and comparison with other types of hydrogen bond suggests that this value corresponds to an interaction energy of around 2.5 kcal/mol. This is a little weaker than a conventional OH…O hydrogen bond, but is still quite significant. Two of these interactions occur in this Pirkle dimer. Points 2 are equally unexpected. They connect the oxygen of the same OH group involved in the previous interaction, and one of the ring C-H groups. Again, that C-H…O groups can interact has only been recognized relatively recently. The value of ρ(r) of ~ 0.018 indicates a hydrogen bond strength of ~3 kcal/mol, again hardly insignificant. There are four specific interactions of the final type 3. These occur in the region of overlap of the two anthracene rings, and these are referred to as π-π stacking interactions. Again, the ρ(r) of ~ 0.005, calibrated against known systems, suggests that each is individually worth around 1 kcal/mol. So adding up all eight interactions indicates that the two molecules of the Pirkle reagent have an interaction energy of around 15 kcal/mol resulting just from these weak bonds (there are other types of interactions between two molecules known as dispersion forces, which also contribute), and which together provide more than enough free energy to overcome the entropy required to bring the two molecules together. Armed with tools such as AIM, one can now be more confident in analyzing the various terms that contribute to two molecules interacting with each other, and in the case of chiral molecules, how these interactions may result in chiral recognitions. This entry was posted on Sunday, April 12th, 2009 at 9:21 am and is filed under Interesting chemistry. You can follow any responses to this entry through the RSS 2.0 feed. You can leave a response, or trackback from your own site. There certainly have been correlations shown for hydrogen bonds between ρ(r at a BCP and the hydrogen bond interaction energy estimated by other methods. I recollect that if carefully calibrated in this way, ρ(r can prove useful. However, -1/2V is clearly independent of the need to so calibrate, and if it gives more generally useful indications, then it would clearly be both quicker and more general. Thanks for the suggestion.